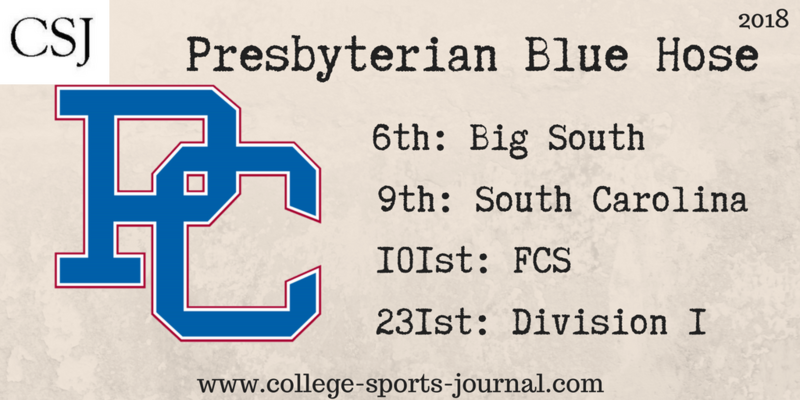 2017 In A Sentence: The good part was that the Blue Hose ended their challenging 2017 campaign with a decent 4-7 record. The bad part was that the Blue Hose’s announcement that they are going to transition to the non-scholarship Pioneer Football League by 2021 meant an exodus of good scholarship players, some of which ended up on FBS programs. Biggest Shoes to Fill: One of the big names that transferred from Presbyterian last year was their leading rusher RB Torrance Marble, who ran for 1,038 yards and scored 6 touchdowns. Key Player: Only 42 players return next season for the Blue Hose, which means the many questions that need answering won’t happen until preseason camp. One of the guys who is returning, though, is OL Tobias Hagins, who started eight games and will likely be the bookend tackle. Fearless Prediction: The Blue Hose’s transition to the Pioneer League is unlikely to be pretty, with another challenging 10 game schedule. Still, there are a lot of incoming freshmen that could make an instant difference – hopefully – for coach Tommy Spangler.